Pizza is a food that never needs translation — it's recognized all over the world. Although you can find pizza almost anywhere you travel, it probably won't taste like what you're used to in the United States. For example, in Brazil, the crust, sauce, and toppings vary depending on the local cuisine and preferences, and anything served on a slice of flatbread qualifies as pizza. Another big difference between Brazilian and American pizza: Brazilians traditionally eat pizza with a fork and knife, rather than with their hands. Pizza arrived in Brazil via Italian immigrants who made Brazil their new home between 1880 and 1930, which is about the same time they came to the U.S. Before 1950, pizza was eaten nearly exclusively by Brazilians of Italian descent who mainly lived in Sao Paulo, but since then, it's become a national favorite, albeit with a Brazilian accent. These days, restaurants in Brazil often serve pizza rodiozio-style, or all-you-can-eat. One of the main differences in American and Brazilian pizza is the crust. While you can find all varieties of crust in the U.S. — thin, hand-tossed and deep-dish or pan pizza — pizza in Brazil always has a very thin crust. The edge of the crust is commonly filled with cheddar or a creamy Brazilian cheese, Requeijão. Additionally, Brazilian pizza tends to have little or no tomato sauce or slices of tomato instead of the abundant sauce on pizza in the U.S. In some parts of Brazil, ketchup is used as pizza sauce. Brazilians are a bit more creative with their pizzas than Americans, and the diverse local ingredients and flavors of Brazil show up on the pizzas. Varied topping, including hearts of palm, catupiry cheese, fresh corn, fresh herbs, mashed potatoes, grilled sausages, potato sticks, and curried chicken with coconut milk are mixed with traditional toppings such as olives, ham, bacon, oregano, mozzarella, and tomatoes. Nothing is off the table when it comes to topping a pizza in Brazil. 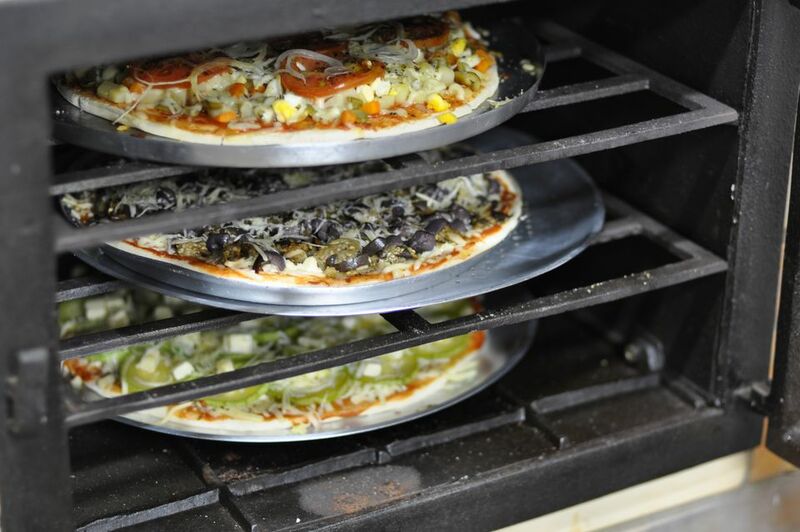 Some Brazilian pizza combinations are extremely similar to American favorites -- tomato sauce, mozzarella, and oregano or four-cheese, for instance, reports the website The Brazil Business. But the four-cheese pizza typically is a mix of mozzarella, gorgonzola, Parmesan and cream cheese, an unheard-of combination in the U.S.
A Brazilian pizza feast would not be complete without a delicious dessert pizza. Plantains, bananas, chocolate, "dulce de leche" ("doce de leite" in Portuguese), strawberries, cooked apples, Nutella, guava paste, cream cheese, whipped cream, and even ice cream are all potential toppings to be served on a thin, bread-like crust. Often the toppings are placed decoratively, arranged in pretty patterns to make a festive party dessert.